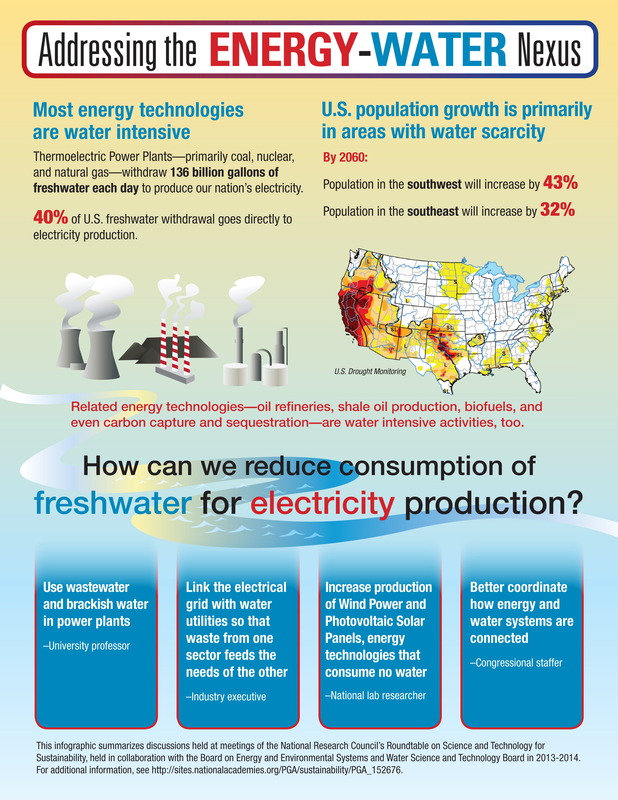 Adequate water and energy are critical to the continued economic security of the United States. The relationship between energy and water is complex, and the scientific community is increasingly recognizing the importance of better understanding the linkages between these two resource domains. Federal agencies, including the Government Accountability Office (GAO) and Congressional Research Service, private sector, and academic researchers have noted that the lack of data on energy-water linkages remains a key limitation to fully characterizing the scope of this issue. The National Academies’ Roundtable on Science and Technology for Sustainability, in collaboration with the Board on Energy and Environmental Systems (BEES) and the Water Science and Technology Board (WSTB), contributed to the emerging dialogue on the energy-water nexus by holding four related meetings in June and December 2013, and May and December 2014. These meetings were designed to examine emerging technical and policy mechanisms to address energy-water issues. The most recent December 2014 Roundtable meeting was the fourth and final meeting on the energy-water nexus. The event featured panel discussions examining energy-water nexus issues, specifically improved data for water use, decision support tools, and decision-based frameworks for local and regional decision-making. This meeting was built on progress made at the 2013 “MIT-CSIS Energy-Water-Land Nexus Workshop,” the 2013 NSF Workshop on “Developing a Research Agenda for the Energy-Water Nexus” and at the prior three roundtable sessions. The purpose of the meeting was to encourage participants to leverage initiatives currently underway in the energy-water nexus and to encourage the application of broader sustainability frameworks to these two inter-related resource domains. In 2013-2014, the Academies' Roundtable on Science and Technology for Sustainability, in collaboration with the Board on Energy and Environmental Systems (BEES) and the Water Science and Technology Board (WSTB), contributed to the emerging dialogue on the energy-water nexus by holding four related meetings in June 2013, December 2013, May 2014 and December 2014. This volume compiles the Meetings in Brief for the four events, highlighting the main topics discussed at each meeting. Note: separate Meetings in Brief for each individual meeting can be found below. The June 2013 meeting featured panel discussions focused on addressing issues related to the energy-water nexus. The meeting examined key questions, including data and partnerships needs for addressing the energy-water nexus. Click here to view the final agenda, power point presentations and meeting summary. 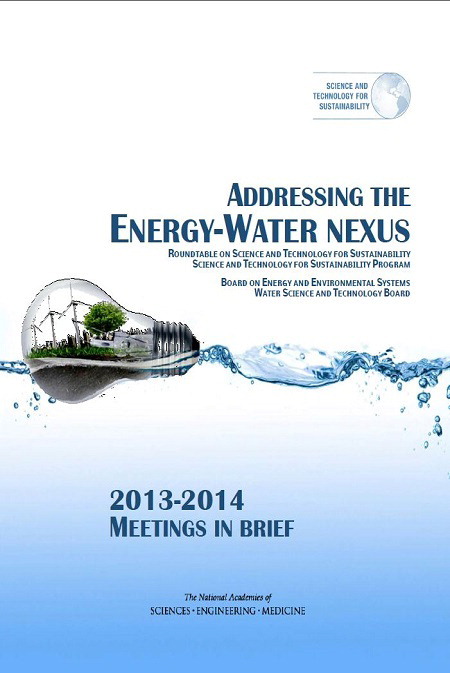 Following up on the June 2013 Roundtable meeting, which introduced and provided a broad overview of the energy-water nexus, the December 2013 meeting delved deeper into energy-water nexus issues. Using a place-based approach, the meeting examined how changing water conditions have affected the operations of power plants and the role of research on new water-saving technologies for power plants. Click here to view the final agenda, power point presentations and meeting summary. The May 2014 meeting featured panel discussions addressing issues related to the energy-water nexus through further technological innovation. The panels examined research needs for optimizing current technologies, addressing existing barriers and emerging technology innovations, and advancing the integrative field of the energy-water nexus to address key challenges. Click here to view the final agenda, power point presentations and meeting summary. As the fourth and final session of the Roundtable’s 2013-2014 initiative, the December 2014 event featured panel discussions examining energy-water nexus issues, specifically improved data for water use, decision support tools, and decision-based frameworks for local and regional decision-making. Click here to view the final agenda, power point presentations, and Meeting in Brief. The Roundtable on Science and Technology for Sustainability is supported by the George and Cynthia Mitchell Endowment for Sustainability.